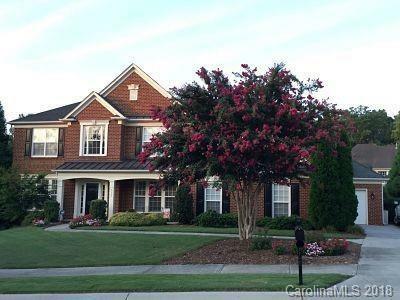 Conveniently located in Elizabeth Place neighborhood, features an open floor plan with beautiful hardwoods, 2-story foyer & family room, dual staircase and lots of natural light; Spacious kitchen opens to family room, dining room and sun room. Perfect for indoor and outdoor entertaining! Sun room overlooks beautiful heated pool with spacious deck. Gourmet kitchen includes granite counter tops, beautiful refinished cabinets, tile back splash, stainless steel appliances; Master bedroom includes trey ceiling, sitting room, wet bar, spacious walk-in closet, large master bath; Upstairs includes 3 additional bedrooms, 2 additional full baths; First floor guest room has full bath; Office downstairs includes french doors; Other features: plantation shutters; crown molding; several storage closets; new hardwood flooring downstairs; utility sink; Close to everything shopping, restaurants, great public and private schools! (Elizabeth Lane Elementary, South Charlotte Middle, Providence High). Offered by Rocket Homes Real Estate Llc. Copyright 2019 Carolina Multiple Listing Services. All rights reserved.